SEVISEQ (Equine Health Surveillance Unit) is created due to the need of support for the official institutions and is focused on several aspects: the high presence of equine infectious diseases in Spain, the existence of clinical outbreaks, the lack of awareness regarding the importance of equine infectious diseases by horse owners and professionals of the equine industry, and the importance of a correct application of prevention and control measures in every equine premises. - Diagnosis of acute infection. - Analysis of samples prior to exportation and sales. 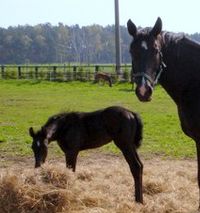 - Analysis of samples for the annual health surveillance in breeding stud farms. - Technical assistance to veterinary surgeons. - Production of health surveillance reports. - Research in equine infectious diseases. Camino E., Carvajal KA., Buendia A., Dorrego Rodríguez A. and Cruz F.. Theileria equi and Babesia caballi in vitro culture. VISAVET Outreach Journal, VISAVET Health Surveillance Centre (U.C.M.). 2018. Chimeno P., Vivas M., Camino E. and Cruz F.. West Nile Virus en Caballos. ¿Qué necesito saber?. Badajoz Veterinaria, Colegio Oficial de Veterinarios de Badajoz. 2017. Camino E. and Cruz F.. EIA: Equine Infectious Anemia. VISAVET Outreach Journal, VISAVET Health Surveillance Centre (U.C.M.). 2017. Camino E. and Cruz F.. Equine piroplasmosis. VISAVET Outreach Journal, VISAVET Health Surveillance Centre (U.C.M.). 2017. Cruz F.. Most appropriate samples to be taken when facing a suspicion of infectious disease in horses. VISAVET Outreach Journal, VISAVET Health Surveillance Centre (U.C.M.). 2016.